I have a new potty system from Piddle Place! 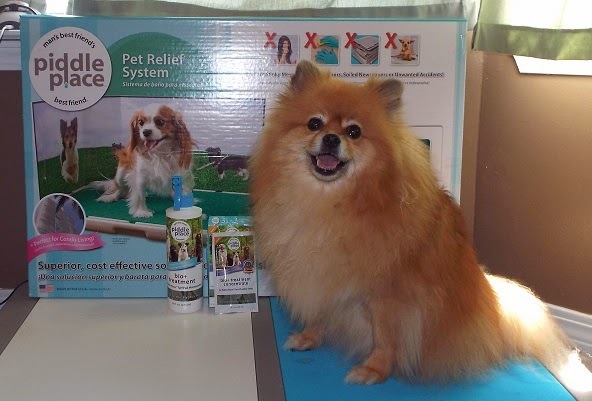 The Piddle Place is a pawsome indoor potty system for dogs up to 28 inches long. The base can tolerate weights up to 100 pounds, but the dog needs to be able to fit on it without their rear end hanging over the edge. It is much more attractive and sanitary than pee pads or litter boxes. Your human doesn't have to see the yellow circles, or vacuum up litter that's been tracked all over the house. The Piddle Place is more cost efficient in the long run compared to constantly replacing litter or pads. I wonder if cats could be taught to use a Piddle Place instead of a litter box? 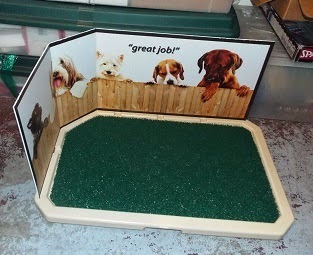 The raised floor grid keeps paws dry as the pee drains through the mesh turf pad, into the channels, and down the drain hole. I don't get any pee on my paws to track on the floor. I like the mesh turf pad because it drains very well and doesn't feel prickly to my paws. The Piddle Place has a furrific valve system for the drain to prevent spills, yet still allow your human to empty the reservoir easily. Use the Bio+Treatment to prevent odors from accumulating on the turf pad or inside the reservoir. The Bio+Treatment doesn't hide odors, it eliminates them. The reservoir can hold a gallon (128 ounces) of liquid. I normally pee 1 or 2 ounces at a time, maybe 5 times a day. Mom usually empties & rinses out the reservoir, and replaces the Bio+Treatment in my Piddle Place every 2 weeks. (Dogs who pee more will need their Piddle Place emptied more often than I do.) Mom sprays the turf pad with the Bio+Treatment after I pee a few times, or when I poop on it, to keep it clean & fresh. Obviously Mom scoops the poop with a plastic bag the same way she does in the yard. BOL! The travel lid makes it easy to carry the unit to the toilet or outside to empty the reservoir without splashing pee on the floor. Note: The lid does not seal airtight, so do not tilt the Piddle Place on it's side with flat edge facing down, or there could be some spillage. You want to keep the tray level or have the side with one corner facing down. The lid helps prevent splash-over, not spills or pours. The lid is also great for car travel because it keeps the turf pad in place and none of your luggage will be touching the potty surface. I think the Piddle Place is the best potty system invented since fenced yards. The Piddle Place is safer than a yard because there are no eagles or coyotes inside the house that might try to eat me. It doesn't rain or snow inside the house either, so that also makes the Piddle Place more comfortable than a yard. BOL! Mo-o-om! I'm peeing, no photos pawlease! It was easy to teach me to use the Piddle Place instead of pee pads. 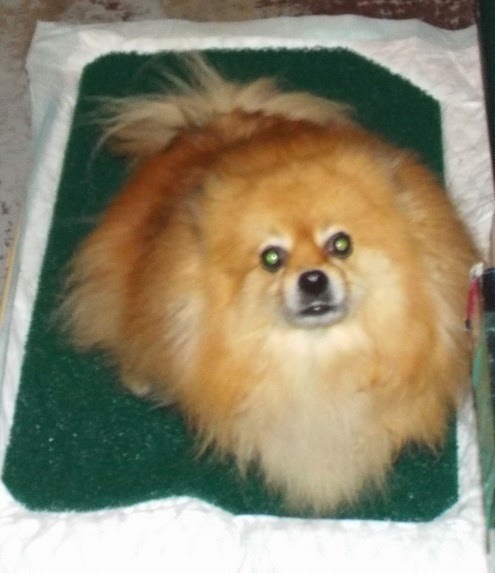 Mom started by placing the Piddle Place next to my pee pads. Then she put a used pee pad under the turf pad for me to smell that the Piddle Place was for me to potty on. After I was using the Piddle Place to potty, Mom put a clean pee pad under the turf pad, and I kept using the Piddle Place to potty. Seriously? The camera during potty time? What is it with humans and cameras? Once I proved that I understood the Piddle Place was to be used like a pee pad, Mom removed the pee pad. I now use the Piddle Place by itself. Mom may have taken more steps than necessary to transition me to the Piddle Place because I am not a puppy. I have been potty trained for over 6 years. Mom didn't want to accidentally confuse me since I am potty trained so well. I probably would have understood how to use it by itself the first night, but Mom wanted to be certain. 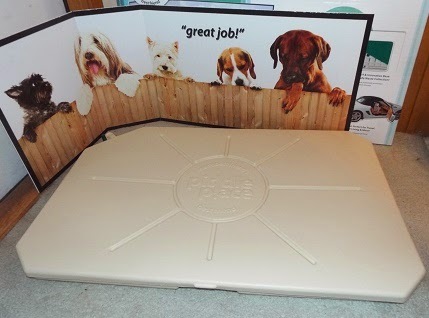 There is a splash board for the Piddle Place if the dog is a boy, or needs help getting positioned in the right spot. I prefer to use mine without the splash board, but Mom puts it up when Baron visits. She doesn't want Baron to miss the Piddle Place and hit her storage bins. Mom has never owned a boy dog, but she knows their leg-lift aim isn't always as accurate compared to a girl dog's squat. 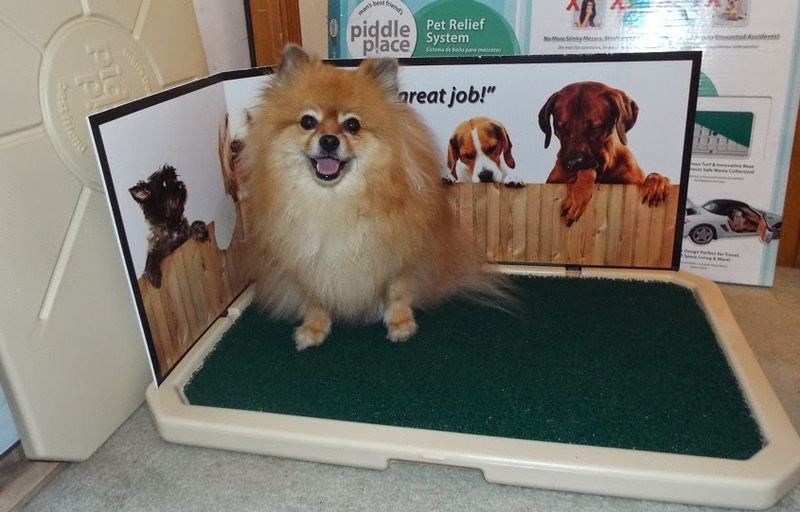 Pawsonally, I think the Piddle Place is the pawfect solution for situations that need an inside dog potty area: potty training new dogs, disabled/elderly owners, owners who work long hours, apartments & homes without fenced yards, motor homes, hotel rooms, bad weather situations (snow, rain, etc...), nighttime, predators (eagles, hawks, owls, coyotes, bobcats, bigger dogs, etc.....), and other inconvenient situations. I use my Piddle Place every night. Where do you potty when you can't use a fenced yard? We only do our big business when we go out on walks, sometimes we pee in the yard, but we get walked plenty and that is our bathroom time. We've never ever been allowed to go in the house. It seems like lots of small dogs have problems with holding it for longer time periods, so maybe that is why these are usually made for smaller dogs. As long as it works for you, why not. Good point. Smaller dogs have a reputation for being difficult to potty train. Small dog = small bladder = small mess. There are differing opinions about the cause, some claim the small mess is less motivating to owners, others say the small bladders require more frequent potty times. I am lucky because my human is always with me. I am one of those dogs that is smart enough, and bossy enough to bark at the door when I need to go outside. Not all dogs are this vocal. My part-time brofur Baron rarely barks to go potty, but I have been teaching him to bark to go out at my house. Our yard door isn't in the same room as the tv, so a bark is needed to get Mom to open the door. 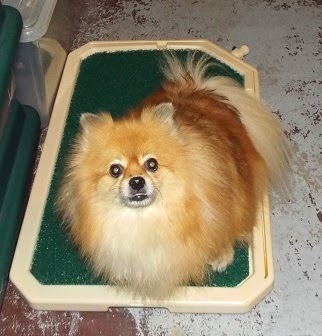 Many small dogs do best if a human is always there to let them out on command, or if there is an alternative potty solution like the Piddle Place. I forgot to woof that most small dogs typically need to go potty every 4 hours (during daylight). Is that more often than a big dog? Most of us (small dogs) can hold "it" through sleep time as adults. I think it is because we don't drink water while we sleep. BOL! That is very cool! Mom says there are a lot of dogs a work that would benefit from this! Thanks for sharing! Thank you, I am happy to be able to woof about products that could make life more pleasurable for dogs and their humans.